Occurrence: The addition of lupin flour to wheat flour has only recently been allowed in several countries (i.e. UK - 1996, France - 1997) and addition to human food has only recently begun in others (i.e. Australia 2001). Almost all cases of food allergy to lupin have followed consumption of such flour, for example, as unlabelled baked onion rings. However, lupin is also eaten whole as lupini in Mediterrean countries. Lupin is peanut's closest relative amongst foods and it has been estimated that approximately 50% of individuals with peanut allergy can react to lupin. Thus the addition of lupin to flour was soon followed by reports of allergic reactions to this hidden and generally unlabelled allergen. In France, the first report of lupin anaphylaxis was in 1999 but by 2002, lupin was the fourth most frequent cause of severe food-associated anaphylaxis reported to the French Allergy Vigilance Network. However, although most cases have involved individuals allergic to peanut, there is at least one report of an individual allergic to lupin and some legumes (chickpea, lentil and white beans) who could tolerate peanut. The reported symptoms of allergic individuals after eating lupin include oral itching and urticaria (hives) and angioedema (wheals) of the skin as well as more severe symptoms (anaphylaxis). Several cases have included acute asthma or breathing difficulty due to throat swelling. It has been suggested that in future lupin should be added to the list of food ingredients that must be labelled. A 5-year-old girl with peanut sensitivity experienced urticaria and angioedema (Hefle et al. 1994 ). A 38-years old atopic woman presented with diffuse urticaria, angioedema, dysphagia, chest tightness, shortness of breath and throat swelling (anaphylaxis) in a single patient (Matheu et al. 1999 ). Allergic rhinitis and asthma, oral allergy syndrone and anaphylaxis in a single patient (Romano et al. 2000 ). Oral and pharyngeal pruritus, “lump in the throat,” and disseminated urticaria of one patient and oral and pharyngeal pruritus in a second patient during DBPCFC (Crespo et al. 2001 ). Urticaria, angioedema and respiratory difficulty in three patients. One suffered acute abdominal discomfort (Smith et al. 2004)  . The seed coats were removed and the cotyledon was ground to a dry paste. This was extracted in a solution of 1 mol/L NaCl and 20 mmol/L Na2HPO4 (pH 7.0) at a 1:10 wt/vol ratio, by stirring, overnight at 4° C. The extract was clarified by centrifugation and dialyzed (Hefle et al. 1994 ). Lupin flour was extracted by a solution of 4% ammonium bicarbonate (1/5 wt/vol) for one night at 4°C with stirring. After centrifuging and sterilizing by filtering through a 0.2-µm membrane, the concentration of protein was determined by using Bradford’s method and found to be 50 mg/mL (Moneret-Vautrin et al. 1999 ). Lupin bran or food containing lupin was extracted with an equal volume of sterile isotonic saline for 10 minutes (Smith et al. 2004 ). Commercial extracts of other plants were used. Positive (histamine 10 mg/mL) and negative control (saline solution). SPT wheal diameters >3 mm as positive. 7 peanut allergic patients (Hefle et al. 1994 ). 24 peanut allergic patients (Moneret-Vautrin et al. 1999 ). 1 patient (Matheu et al. 1999 ). 7 subjects occupationally exposed to lupin flour (Crespo et al. 2001 ). 3 patients after clinical reactions to products containing lupin (Smith et al. 2004 ). 11/24 (44%) SPTs to lupin were positive (Moneret-Vautrin et al. 1999 ). 7/8 challenge positive patients gave positive SPT with 7 to 14 mm wheals. A patient was tested in 1992, 1996 and 1997. In 1992 she was SPT positive to chickpea. In 1996 she was SPT positive to chickpea, white bean, pea, lentil, soybean and lupine but negative to peanut, chickling and green bean (Matheu et al. 1999 ). 3/7 positive SPT (4, 18 & 20 mm). Last two patients were also positive by DBPCFC (Crespo et al. 2001 ). All 3 patients gave positive SPT to lupin with 9, 12 and 9 mm wheals (Smith et al. 2004 ) and one gave a positive SPT to an extract of a bread roll containing lupin flour. None were positive for peanut or soy allthough there was a 2 mm wheal for peanut and a 3 mm for soy in different patients. These 2 were SPT positive for pea with 8 mm and 10 mm wheals and showed 3 mm wheals for wheat. RAST direct, RAST inhibition and immunoblots (Hefle et al. 1994 ; Moneret-Vautrin et al. 1999 ). CAP and ELISA (Matheu et al. 1999 ). CAP-FEIA (Crespo et al. 2001 ). 7 patients with peanut allergy (Hefle et al. 1994 ). 6 DBPCFC positive patients (Moneret-Vautrin et al. 1999 ). Sera studied from the challenge positive patients showed high concentrations of peanut specific IgE by RAST with 15, 65, 70 and 5 sera > 100 kU/L by RAST. The 6 sera with strongest peanut IgE binding showed lupin pollen specific IgE concentrations of 4.4, 4.5, 5.7, 8.6, 57 and 74 kU/L by RAST-CAP and 1.45, 7.8, 3.5, 2.35, 2.5 and 3 kU/L by RIA (Moneret-Vautrin et al. 1999 ). Matheu et al. (1999)  tested sera taken from a patient in 1992, 1996 and 1997. In 1992 the sera contained 1.3, 2.6 and 2.2 kU/l of specific IgE to white bean, pea and soybean. Peanut was negative and no other legumes were tested. In 1996 the sera contained 2.36, 2.71, 3.89, 6.54, 1.18, 3.69 and 2.37 kU/l of specific IgE to chickpea, white bean, pea, soybean, peanut, lentil and chickling. In 1997 the sera contained 3.46, 2.94, 3.9, 4.11, 1.2, 4.1 and 1.23 kU/l of specific IgE to chickpea, white bean, pea, soybean, peanut, lentil and chickling. Green bean was negative and lupin was not done. ELISA showed antibody to lupin, chickpea, white bean and lentil. Chickpea, white bean, peanut, lentil and pea gave 83%, 86%, 62%, 32% and 27% inhibition with lupin as the solid phase. Hefle et al. (1994)  report 4/7 significant RAST scores (cpm patient/cpm control) of 2.3, 2.6, 3.0 and 5.7 (others 1.1) for their patients with lupine extract (slightly higher when extract was ammonium sulfate precipitated) and 3.2, 4.4, 6.5 and 11.1 for the same patients with peanut (others 1.0-1.5). RAST inhibition was seen with lupin extracts (including from a pasta) and crude peanut extract. Samples were separated by SDS-PAGE on a 12% gel with a 6% concentration gel in a Tris-Tricine system. The samples were diluted in a sample buffer containing 1% SDS and heated for 3 minutes at 95°C (Moneret-Vautrin et al. 1999 ). Matheu et al. (1999)  used 12.5% SDS-PAGE for separation. Proteins were separated on 12.5% SDS polyacrylamide resolving gels with 4% stacking gels. Samples were boiled for 5 minutes in sample buffer containing 40 mmol/L dithiolthreitol (Hefle et al. 1994 ). Moneret-Vautrin et al. (1999)  used a semidry transfer onto a cellulose nitrate membrane (BA 83 S; Schleicher and Schull, Dasel, Germany) in a Tris-glycine-methanol buffer for 1 hour at 0.8 mA/cm2 of gel. The membrane, cut into 3-mm strips, was saturated in a solution of PBS-0.1% (v/v) Tween and 1% (w/v) BSA for 1 hour. Strips were incubated with the diluted sera (1:20 for peanut and 1:5 for lupin flour) and a control buffer for one night with stirring. After 3 washes in PBS-0.1% Tween, 10,000 cpm/strips of 125I-labeled mouse anti-IgE human mAbs (Immunotech, Marseille, France) were incubated for one night. After 3 washes, the strips were subjected to autoradiography for 10 days. Matheu et al. (1999)  transfered proteins electrophoretically onto a PVDF membrane (Immobilion-P, Millipore, Mass.). Hefle et al. (1994)  transferred Proteins to an Immobilon P (0.45 µm; Millipore, Mass.) membrane in a Bio-Rad Transblot apparatus for 2 hours at 50 V, according to the method of Towbin et al. (1979). The membrane was blocked with 0.01 mol/L PBS containing 3% (w/v) bovine serum albumin (PBS-BSA) for 1 hour at 25° C. After washing three times with PBS containing 0.05% (v/v) Tween 20, the membrane was cut into strips, which were incubated with peanut-sensitive patient sera (diluted 1:10 in PBS-BSA) for 18 to 24 hours at 4° C. The strips were washed again, and then incubated overnight with 2 ml rabbit anti-human IgE labeled with iodine 125 (diluted in PBS-BSA to 70,000 cpm/ml) (Phadebas RAST kit; Pharmacia Biochemicals, Piscataway, N.J.). After washing again, IgE binding was revealed by exposing x-ray film to the strips at –70° C for 3 days. Lupin immunoblots with sera from patients allergic to peanut revealed IgE binding bands at 65, 43, 38, and 13 kDa (Moneret-Vautrin et al. 1999 ). All sera bind IgE at 43 kDa. IgE binding to the 43 kDa band, but not the 65, 38 or 13 kDa bands, could be inhibited by peanut extracts. However, lupin extracts could not be shown to inhibit IgE binding to peanut by immunoblotting. Matheu et al. (1999)  found 8 IgE binding bands between 12.5 and 61 kDa. 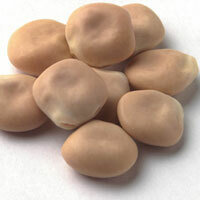 The bands from 26.5 to 61 kDa were partially inhibited by extracts of other legumes (chickpea, peanut and white bean). Hefle et al. (1994)  found that serum IgE from 6/7 patients with peanut allergy bound to a lupine protein band at 21 kDa and to several bands with molecular masses in the range of 35 to 55 kDa. Sweet lupin seed flour was used in all studies (Moneret-Vautrin et al. 1999 ; Kanny et al. 2000 ; Crespo et al. 2001 ). Crespo et al. (2001)  mention masking in a vehicle containing wheat flour, milk, vanilla, sugar, cinnamon, and liquid coloring. 8 patients, 2 of whom were challenged by labial food challenge (Moneret-Vautrin et al. 1999 ). Positive responses at 965 mg, 7110 mg, 10 and 20 g of lupin flour (Moneret-Vautrin et al. 1999 ). Positive response at 965 mg. of lupin flour (Kanny et al. 2000 ). Positive responses at 116 and 386 mg of lupin flour and one negative challenge (Crespo et al. 2001 ). Symptoms:7/8, including one with a negative SPT, reacted with urticaria and angioedema, pruritus of oral mucosa, asthma, rhinorrea, conjunctivitis, cough, dyspnea and cyanosis (Moneret-Vautrin et al. 1999 ). Hefle et al. (1994)  reports that 5/7 peanut allergic patients had positive SPT to lupin after one reported symptoms and that these individuals also reported reactions against green pea. Clear IgE cross-reactivity was demonstrated by Moneret-Vautrin et al. (1999 ) between peanut and lupin although since lupin was unable to inhibit peanut binding to IgE, it may be that peanut was the initial sensitizer. Matheu et al. (1999)  report a patient who was allergic to several legumes. An open challenge showed that she could tolerate 8g of peanut or green bean but gave itching and watering eyes, rhinorhea, sneezing and itching palms with pea. Symptoms had been seen chickpea, lupine, white bean and lentil. IgE cross-reactivity was also observed by immunoblotting inhibition. Faeste et al (2004)  reported that a peanut-allergic patient reacted against hidden lupine protein in hot dog bread. In summary allergy to lupin seems to be associated with multiple sensitisations and IgE cross-reactivity to other legumes. Moneret-Vautrin et al. (2004)  report a significant prevalence of severe reactions to lupin flour in France. That lupin allergy can be severe is emphasised by Gutiérrez et al. (1997)  who reported urticaria of a 25 year old man after kissing his girlfriend who had previously eaten lupin seeds. Parisot et al. (2001)  report a case of rhinitis, conjunctivitis, and palpebral angioedema caused by handling lupin flour. The patient was not allergic to peanut but IgE also bound to peanut. Novembre et al (1999)  report a case of severe asthma caused by inhalation of lupin in dust form in a 3 year old child. The prick by prick test was markedly positive. Romano C, Ferrara A, Falagiani P.
A case of allergy to globe artichoke and other clinical cases of rare food allergy. Kanny G, Guerin L, Moneret-Vautrin DA. Parisot L, Aparicio C, Moneret-Vautrin DA, Guerin L.
Crespo JF, Rodriguez J, Vives R, James JM, Reano M, Daroca P, Burbano C, Muzquiz M.
Occupational IgE-mediated allergy after exposure to lupine seed flour. Matheu V, de Barrio M, Sierra Z, Gracia-Bara MT, Tornero P, Baeza ML. Hefle SL, Lemanske RF Jr, Bush RK. Adverse reaction to lupine-fortified pasta. Gutiérrez D, Conde A, Duran S, Delgado J, Guardia P, Martinez R, Garcia-Cubillana A, Gonzalez J, Conde J.
Novembre E, Moriondo M, Bernardini R, Azzari C, Rossi ME, Vierucci A.
Lupin allergy in a child. Cross-allergenicity of peanut and lupin: the risk of lupin allergy in patients allergic to peanuts. Smith WB, Gillis D, Kette FE. Lupin: a new hidden food allergen. Faeste CK, Lovik M, Wiker HG, Egaas E.
A case of peanut cross-allergy to lupine flour in a hot dog bread. Magni C, Herndl A, Sironi E, Scarafoni A, Ballabio C, Restani P, Bernardini R, Novembre E, Vierucci A, Duranti M.
One- and two-dimensional electrophoretic identification of IgE-binding polypeptides of Lupinus albus and other legume seeds. Nature of main cross-reacting proteins:Lupin shows IgE cross-reactivity with peanuts. The reaction to peanuts is more severe than to lupin and/or other legumes. The major lupin flour allergen (molecular mass, 43 kDa) is completely inhibited in immunoblotting by peanut extracts. The 65, 38, and 13 kd lupin allergens were not inhibited. Moneret-Vautrin et al. (1999)  reported that 5/6 sera detected the 43 kDa allergen from lupin. Hefle et al. (1994)  found 6/7 sera from peanut allergic patients contained IgE that bound to 35 to 55 KDa lupin proteins. Matheu et al  detected band between 12.5 to 61KDa.